You all know how much I love talking about fashion, but did you know my second passion is beauty products? I'm not skillful enough to write about them properly - there's plenty of amazing blogs out there for that but this survey has been floating around for a while now so I thought I'd be fun to give it a go! 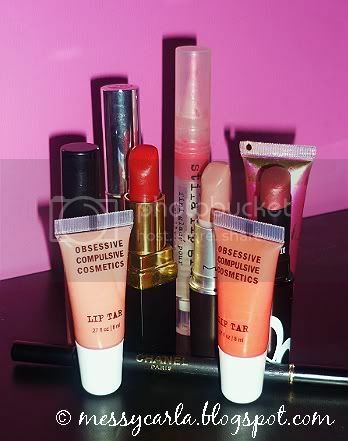 My collection of lip products. Once in the morning, and once again if I’m going in on the evening. I rub a face wipe over my face before going to bed. I think it’s tempromental? I have mostly dry days, but sometimes my nose and chin can get oily, so I have to alternate what products I use. I also have a few bumps on my cheeks due to having elastoplasts/band-aids on my face during an operation a few years ago, and I’m allergic. My skin felt like it has burned off, I looked a mess and it’s left a little scarring behind. I can feel it, more than see it, though. Clean & Clear’s Daily Exfoliating Wash is great and doesn’t leave any residue as I think a lot of washes too. Definitely, my skin feels kind of rough without it. Soap & Glory and Clean & Clear. Purity – which is wonderful for sensitive skin. I use Body Shop body butters on the rest of my body – my favourites are Hemp, Vitamin E, Coconut and Carrot. The odd brown freckle dotted around my body. My favourites are two freckles on my neck that look like vampire bites! Nope, just a few teenage spots - at 21! I always rest my hand on my chin, so I usually get outbreaks there. MAC Foundation in NW15. It’s definitely not perfect – it’s a bit too milky for my liking, so I need to get shopping around for a better one. Nah, I just load up on the foundation which isn’t big or clever. I don’t think I suit them, and my skin is sensitive to things like glue. Applied properly I think they look fabulous with the right look. Yep, but I pile on so much mascara I go through it in about this time. They’re two different things to me – one is a store selling lots of brands of makeup, and one is a specific brand of makeup? Hmm, except MAC (which it doesn’t stock) I buy my makeup in Boots (they have a brilliant loyalty points scene) or online. A brush set from The Body Shop. I prime with a shadestick by MAC. A small amount of moisturiser. My Italian aunties were all beautiful, had great skin for their age and swore by the importance of moisturising! Liquid eyeliner for the upper lip and pencil for the lower/waterline. How often do you poke your eyes with a pencil eyeliner? I don’t think I have. I’ve had liquid eyeliner in my eye a few times and it HUUUUURTS. I’ve also poked myself in the eye with a mascara wand a fair lot. I’m dead clumsy. I love MAC’s. They’re so long-lasting and gorgeous colours. They seem to last forever too! I haven’t tried it, and don’t know enough about it to be too interested. At the minute do OCC Lip Tars count as they’re liquid lipstick? I liked LimeCrime before I found out about the drama, but aside from that they’re very drying and stained like mad. I’m dying to try Barry M’s – task for next week I think. I’ve only really gotten interested in lip colours the past few months. I used to love my Stila lipgloss, but it’s so hard to find here now. The one I use now is by MAC and lovely. It’s pink and by The Body Shop. It also kind of smells like strawberries! But having naturally pink skin, I don't tend to worry too much about blush. Only a few shadesticks. I’m too aware of a lot of fakes on there. Do you go to CCO's (cosmetic company outlets)? Oh yeah, I always have to have makeup wipes at the ready. I’m not a fan of orange fake tan, dark lipliner and light lipstick, and I don’t like pink/red eyeshadow. I like dark eyes and quirky lip colours. As for neutral though I’m LOVING the pale pink lips trend, I think it’s too cute. Lady Gaga and Gwen Stefani. Only when I have cold, or I’m doing solo uni work and know I won’t be seeing anybody I know. Do you think you look good without any make up on? Haha, I’m such a cheerleader for ‘real’ girls, but I think I suit a bit of slap. My friend Sarah once said to me “Oh Carla, you do scrub up well!” and I think she’s right. Barry M, MAC, Chanel and OCC. It’s expressionate, and easier to allow you to experiment with your look than any other medium. If you don’t like it – you can always wash it off again. I don't read a lot of beauty blogs (I'm generally more interested in fashion blogs), but my favourites are Funny Face's Place with the gorgeous Lillian (who I actually discovered though YouTube - her accent is completely adorable!! ), and my friend Sarah's over at Quirky Face because they both seem to offer something a bit different! But I'm doing a proper post soon about my favourite bloggers and vloggers, so stay tuned. This week has been so busy, but thankfully productive. Tuesday was principal recording for my radio drama dissertation with the actors which was nerve wracking as I've never directed before. But everything seemed to flow, and my cast were fabulous! Anna Leigh Middleton who kindly played one of the roles is also a wonderful local country/folk pop singer. This is the music video for her song Let The Music Take You There. There's more tracks on her MySpace. As for me, I only have ONE MORE assignment due for the end of this week, then we can get vaguely back to normal until the pace picks up again! I miss doing this more regularly. I even have a few reviews to do over the weekend. The thing I'm most excited for is hosting my 100 Followers Giveaway (although I now have 114 now - HELLO NEWBIES!) sometime early next week - it's going to be fuuun! Finally in NON-FASHION NEWS (*GASP! *) I was once agin in our local paper. The journalist Johnny Wilson who kindly did the feature on my blog a few weeks ago asked for a few quotes on an article about Facebook and social networking. You can give it a read here - I'm about halfway down. Thank you again for all your lovely comments you leave (you lot are honestly too kind), the people who have been pimpin' this blog in LJ communities (I can't view the entries as I'm not a member, but thank thank thank you) and following me on Twitter. You're the BEST! PS: Daniel keeps trying to convice me to start a weekly event called 'Fashion Police Friday'. He's dying to make me a bit more controversial! Hmph! love it! Gosh, you do everything soooo well lovely! And yes, you do scrub up well, nowadays you're always looking so beautiful! And lets be fair, none of us were particularly beautiful back then (of course except Amber!!!) wonderful! You're amazing! I have just come across your blog and I love it. I´ll visit it again! Awesome! I've been meaning to ask if you could recommend a mascara brand! How in the world did you find that five-year-old post? What a Great FAQs! Bundle of Thanks for Sharing!